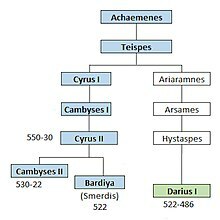 King Darius says: My father is Hystaspes [Vištâspa]; the father of Hystaspes was Arsames [Aršâma]; the father of Arsames was Ariaramnes [Ariyâramna]; the father of Ariaramnes was Teispes [Cišpiš]; the father of Teispes was Achaemenes [Haxâmaniš]. King Darius says: That is why we are called Achaemenids; from antiquity we have been noble; from antiquity has our dynasty been royal. 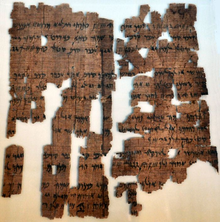 King Darius says: Eight of my dynasty were kings before me; I am the ninth. Nine in succession we have been kings. King Darius says: By the grace of Ahuramazda am I king; Ahuramazda has granted me the kingdom. The Anubanini rock relief (also called Sarpol-i Zohab) of the Lullubi king Anubanini, dated to circa 2300 BC, and which is located not far from the Behistun reliefs at Sarpol-e Zahab, is very similar to the reliefs at Behistun. 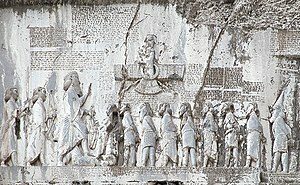 The attitude of the ruler, the trampling of an enemy, the lines of prisonners are all very similar, to such extent that it was said that the sculptors of the Behistun Inscription probably have seen the Anubanini relief beforehand and were inspired by it. 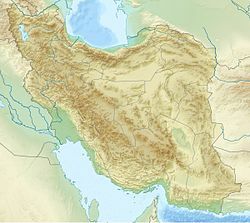 The Lullubian reliefs were the model for the Behistun reliefs of Darius the Great. This page was last edited on 1 April 2019, at 16:59 (UTC).